Each player then has 2 cards dealt face down to them one at a time, starting with the small blind and moving clockwise around the table. Each player looks at his cards, but hides them well from the other players. There now follows a first round of betting. The player seated to the left of the big blind is the first to act. He has to decide whether to call, that is, to match the big blind's bet of $5, raise (to $10), or fold. 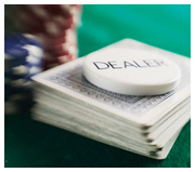 Once the first player has acted, then all the other players act in turn also deciding whether to call, raise or fold. There can only be a maximum of three raises in any single betting round. So if Player 1 does raise (to $10), Player 2 may re-raise (to $15), and Player 3 may re-raise again (to $20). The betting would now be capped, and no further raises would be allowed. When the betting reaches the blinds, the small blind has already put in a half- bet, so only needs to put in the other half to call and stay in the pot (if there have been no raises). The big blind has already bet enough to stay in (again assuming no raises), and so has an option not available to the other players, this is the option of checking, which means passing the opportunity to bet. Once a raise has been made, each subsequent player must match the raise in order to stay in the hand. So if all the players call, and the big blind, who is always the last to act, raises, then every player must in turn make a second decision, whether to call the raise or fold, leaving their initial calling bet behind on the table.